Newcastle's Foote – The Marquess of Newcastle's Regiment of Foote, A Sealed Knot Society Regiment. Welcome to Newcastle’s! We’re a regiment of the Sealed Knot Society, the largest re-enactment society in Europe. 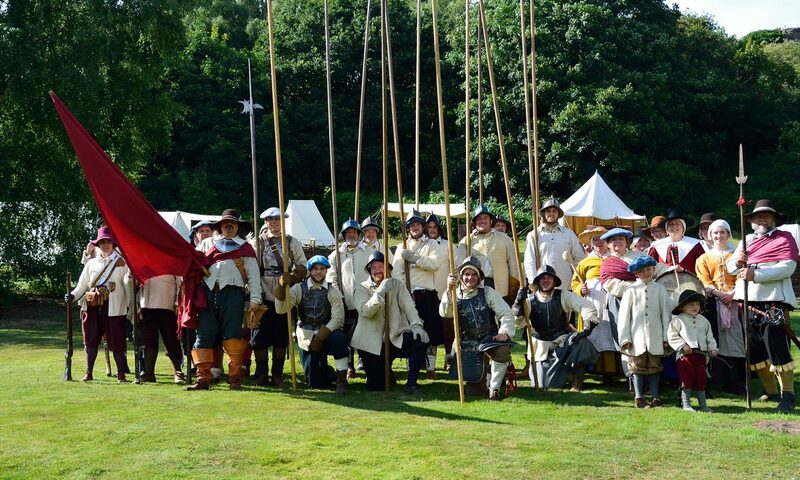 We take part in events up and down the country every year, depicting life in the 17th Century and putting on re-enactment battles of the English Civil Wars which took place across the British Isles from 1642 to 1651. You can find out all about the history of the original and the modern day regiment, what we get up to as a re-enactment regiment and what we’ve got coming up, by exploring our site. If you already know you want to come along, head to the Joining Us page to get the ball rolling. We also update our Blog regularly with all sorts of interest posts ranging from Q&As with member of the regiment, round ups of the events we’ve been at and wider historical interest posts about life in the 17th Century. Fancy having a little update of what we’ve been getting up to, what’s coming up and some exclusive content, not published anywhere else, sent straight to your inbox? You can sign up here for our newsletter that comes out regularly throughout the year. Want to stay connected? Follow us on Facebook, Twitter and Instagram to get frequent updates of what’s happening. Newcastle's Foote shared a post. We're really passionate about helping to preserve this wonderful building and are really excited to be putting on an event here over the May day bank holiday in a couple of weeks time- do come and see us! www.facebook.com/626378594055100/posts/3148862018473399/We were thrilled to welcome members of the Sealed Knot to Wentworth Woodhouse recently to present them with their inscribed slates, dedicated in memory to Thomas Wentworth, 1st Earl of Strafford, and his part in the lead up to the Civil War. Their slates will soon be laid over the state rooms on the East Front as we undertake an ambitious project to repair and restore the 18th century mansion roof. You too can make your mark on the house by sponsoring a personalised slate and support our work to save Wentworth Woodhouse for future generations. Unfortunately, due to illness this post will not be ready for this year. Will now have a whole year to do this incredible lady justice in time for International Women’s Day 2020! All photos are by kind permission of members of the society, including the Sealed Knot Photography Team and members of the regiment.